Child abuse is never far from the headlines in New Zealand. We like to think of ourselves as a great country in which to live, work and raise our families. While that is the case for the vast majority of New Zealanders, for a vulnerable minority of children living in violent families, life falls well short of these ideals. In 2007, the Labour Government banned smacking, telling us that would fix the child abuse problem. We knew that was a lie. The ban was purely political – Labour had lost an MP and passing Sue Bradford’s anti-smacking law was the price they had to pay for the Green Party’s support. Over the years, there has been a great deal of tut tutting and hand-wringing by politicians about child abuse. Child, Youth and Family (CYF), the government’s care and protection agency, has been reviewed and restructured multiple times. But the problems for the children at the centre of the child abuse scandal remains. The National-led Government is also committed to improving the situation and in April the new Minister of Social Development, Anne Tolley, set up an Expert Panel to develop a new child-centred operating model for CYF. The Panel is led by Paula Rebstock, the Chair of the Work and Income Board, who oversaw the major reforms of social welfare. Along with her is Mike Bush the Commissioner of Police, Peter Douglas the former head of Maori Strategy for CYF, Duncan Dunlop the Chief Executive of an independent charity for young people in care in Scotland, Helen Leahy a Specialist Advisor for Ngai Tahu, and Professor Richie Poulton, the Chief Science Advisor to the Ministry of Social Development and the Director of Otago University’s Multidisciplinary Health and Development Research Unit, which is conducting one of the most detailed longitudinal studies of human health and development ever undertaken. 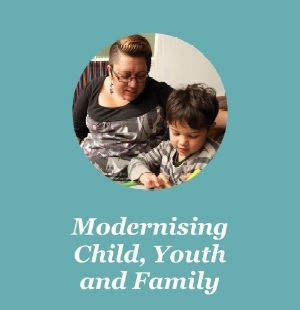 Last week the Minister released the Panel’s interim report, Modernising Child, Youth and Family – and an associated Cabinet paper – providing an insight into the nature of the agency’s deep seated problems and outlining the direction of their proposed reforms. The Panel’s report helps us to understand why, in spite of the best efforts of those involved in preventing child abuse, we have failed to solve the problem. Having examined the way CYF operates, the Panel has concluded that while there is a committed workforce and ‘pockets’ of good practice, the system as a whole is not delivering effectively for children and young people. Essentially, while the overall number of children coming to the attention of CYF has been decreasing over recent years, an increasing proportion of cases relate to the re-victimisation of children already known to the service – in 2014, six out of ten care and protection notifications were for children previously referred to CYF. In other words, the agency is failing to keep abused children safe from further harm. The report identifies that the ‘average’ vulnerable child, who is between seven and eight years old, has had seven to eight different placements. For children who crave stability and love, such disruption in their lives has long term impacts. The Panel found that CYF is suffering from deep and systemic failure. Very few of the contracted services provided to vulnerable children and their families were being monitored or evaluated sufficiently to determine whether they work. The agency itself was unable to demonstrate that it is making a sufficiently positive difference in the lives of the children and young people it serves. Having identified the problems in the current system, the Panel is now designing a new operating model, to deliver to the government in December. The new system is expected to be rolled out in 2016. The Panel believes that the long-standing vulnerability of many New Zealand children is the most pressing social issue confronting society today. It is a problem that spans generations – the abused children of today, all too often become the abusers of tomorrow, not only creating new victims but generating enormous social costs in health, education, social welfare, housing, and the criminal justice system. Most of the families of the children referred to CYF have high levels of disadvantage. Over a third of the parents were known to CYF as a child. There are high rates of welfare dependency and sole parenthood, along with unaddressed physical and mental health needs, alcohol and drug addictions, and family violence. In the five years prior to the birth of the child, in almost 70 percent of cases Police had records of at least one family violence incident, and in more than a third of cases, a parent had served a criminal sentence. Children subjected to abuse have a greater tendency than other children for self-harm, risky sexual behaviour, obesity, drug and alcohol problems, poor mental health, and criminal behaviour. Those that require the intervention of CYF have dramatically worse outcomes as young adults than the rest of the population – they are far more likely to leave school with few qualifications, collect a benefit or receive a community or custodial sentence. When it comes to the needs of abused children, the Panel found that their most basic desire is to be part of a family that loves and protects them. But the data on outcomes is damning. Many children were not only re-abused while in State care (the report notes evidence of “significant re-victimisation of children and young people while in the care of the State”), but they were also subjected to abuse, once they were returned to their family or whanau. Children being returned from care placements back into the care of their biological parents in their dysfunctional homes in 2010 were 23 times more likely to be abused than children who remained with unrelated carers. Children being returned to family or whanau placements were 10 times more likely to be abused. These figures have led the Prime Minister to question the wisdom of a policy that requires vulnerable children to be sent back into the care of their dysfunctional families and whanau, rather than being found safe and stable homes elsewhere. The problem is with the law as it stands – the preamble to the Children and Young Persons and Their Families Act 1989 states that matters relating to children in need of care or protection must be “resolved, wherever possible, by their own family, whanau, hapu, iwi, or family group”. In other words, the law requires vulnerable children to be placed back into the care of their families and whanau as a priority – even if more suitable carers are available. John Key believes the law should be overhauled – when it comes to the safety of children, the best interests of the child should be the priority, rather then the needs of the family or whanau. When it comes to caregivers, the Panel found that CYF has around 3,500 to call on, but of those, 1,500 or so would not have children in their care at any particular time. Around 42 percent of all caregivers are social welfare beneficiaries, with almost half of the family or whanau caregivers on a benefit, and a third of unrelated carers. Quite simply, that means that many of those caring for the country’s most vulnerable children are themselves dependent on the State. Astonishingly, the Panel found that in spite of the huge pressure for care beds – around 2,000 children go into state care each year with 5,000 in care at any one time – CYF has no nationally co-ordinated approach to recruiting caregivers. All too often this leads to vulnerable children, who crave a loving family environment, being re-traumatised by being placed in CYF residences. As at February 2015, CYF employed around 3,200 full time staff, but less than 25 percent of those employees work directly with children in need of care or protection. And despite the complex nature of front-line work, less than 1 percent of the current workforce has a dedicated professional support role. Overall, the Expert Panel found that in spite of the best intentions of CYF workers, the current operating model is focused on the system and processes, rather than on the needs of the child. The overarching desire, expressed by abused children to the Panel, to belong to a family to love and care for them, raises vexed questions about whether the anti-adoption ideology that has long dominated welfare services in New Zealand is doing more harm than good. “Adoption wasn’t always ideal but neither is constant upheaval from one foster placement to another or institutional care. Adoption appeared to produce a better result than the current philosophy of striving to keep the child with its birth mother or family at any cost. Because odds are, the child ends up in state care anyway, more damaged than he or she would have been if adopted out at birth. Without a doubt, adoption should be re-assessed, especially in light of the revelations by CYF Minister Anne Tolley that some abusive women have had up to seven children permanently removed from their care. The Minister says more needs to be done to discourage such negligent parents from having more children – and while that is certainly the case, finding such children permanent homes, rather than leaving them in State care, should surely be a priority. It is an unfortunate fact of life that at the heart of the child abuse crisis are government incentives for women to have children they are ill-equipped to provide for. Until the State stops paying women to have babies, children will continue to suffer. The State is no substitute for a loving mum and dad, and no role model for a child. In fact it’s a tragedy that idealists have exerted such influence on policy and brought us to the systemic failure we have today. The child abuse crisis is a national disgrace. Only the State could fail children on such a monumental scale. Anyone concerned should read the Expert Panel’s report. It helps to explain why, in spite of the very best efforts of those who are trying to help, the child abuse crisis continues unabated. Do you agree that the child protection system needs to be overhauled? It is well known that good childless couples often wait years to adopt a child. Some are never successful. I am astonished that there were only 21 adoptions in 2011/12. Yes whilst not ideal, an adoption is better than some of the appalling situations children are subjected to. Why has adoption been done away with. PC reasons?? Families with a record of child abuse, must be prevented from producing more children. Do it and disregard the PC issues. Reinstate adoption. For all the trumpeting success of whanau ora is it really doing a good job? It wastes money on hip hop overseas travel and gang reunions. Those groups cannot be trusted to spend our tax dollar carefully. Get rid of them. All this bowing and scraping to the gimme gimme gimme crowd does no one any good. Chris.